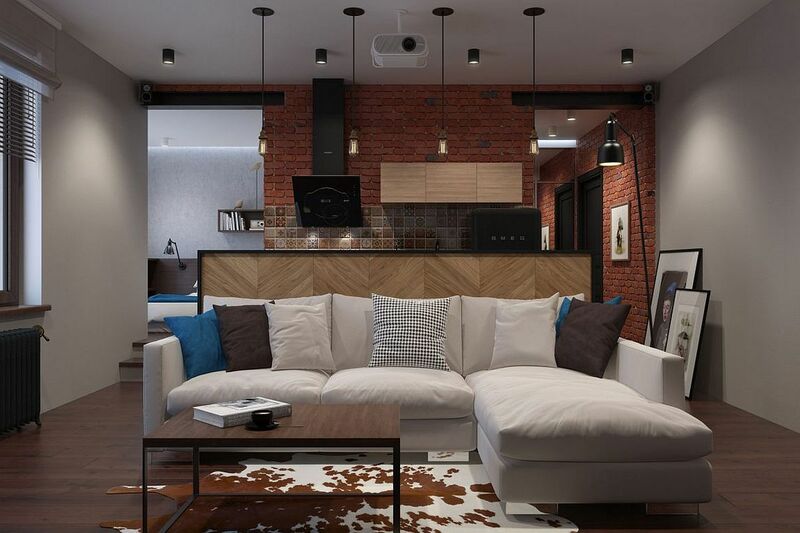 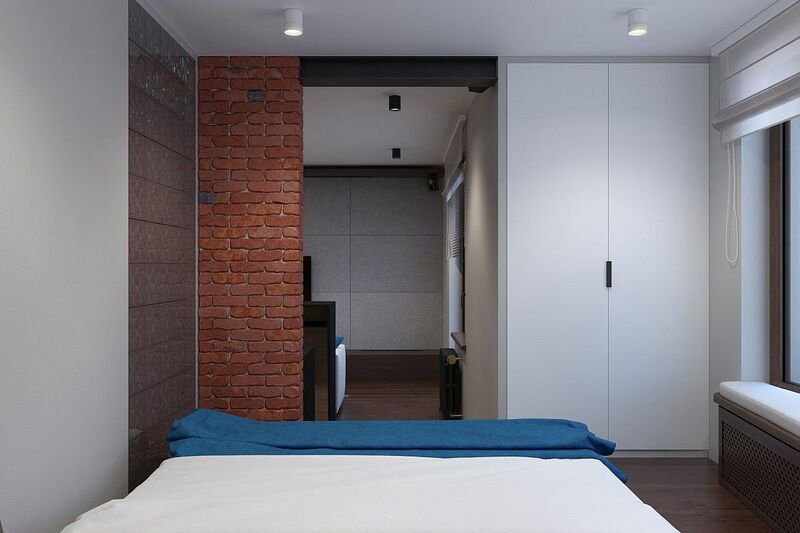 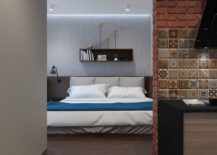 Turning a tiny apartment into a functional and aesthetic bachelor pad, Perhushkovo is one of those smart urban settings where every inch of space matters. 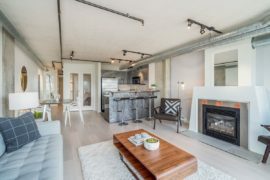 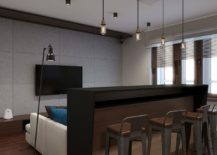 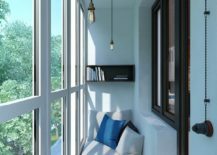 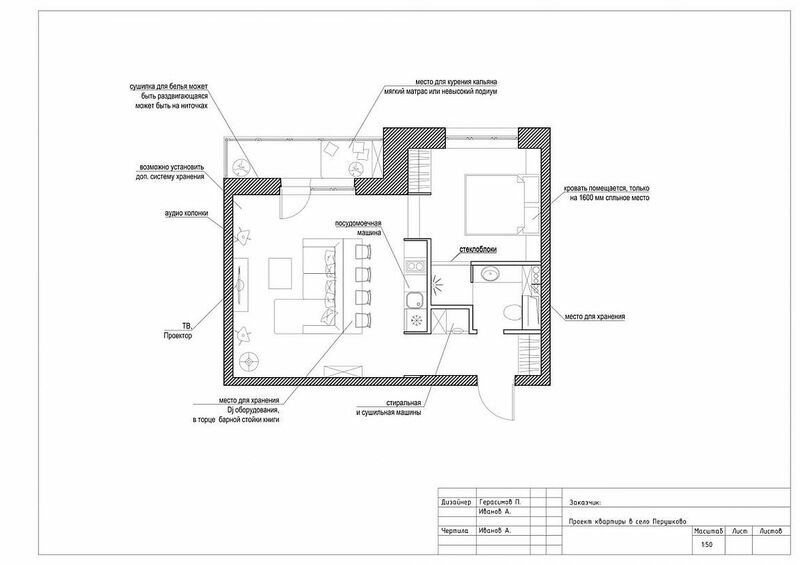 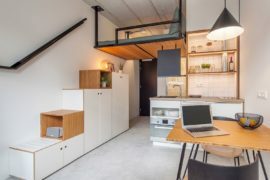 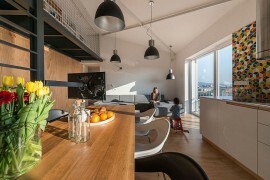 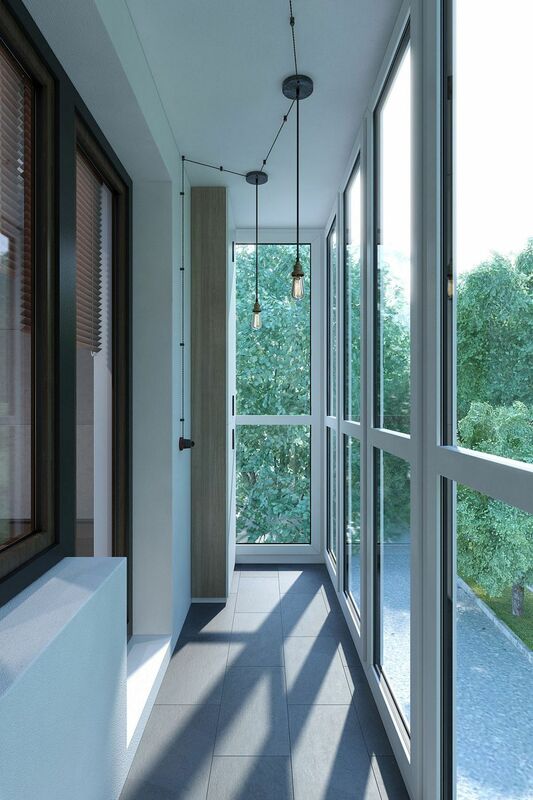 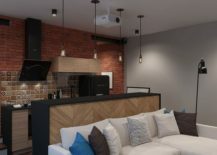 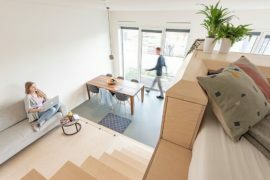 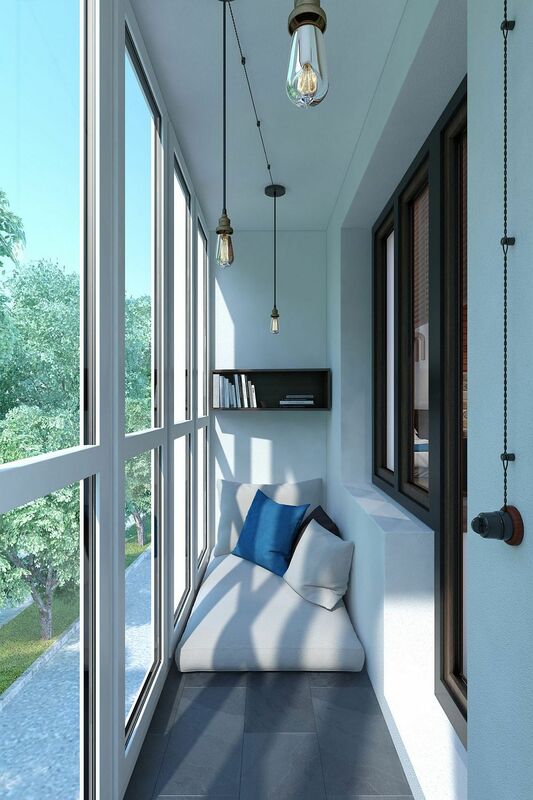 Geometrium designed the small bachelor loft keeping in mind both the specific requirements of the young homeowner and the way in which the interior brought along with it a certain distinct industrial past. 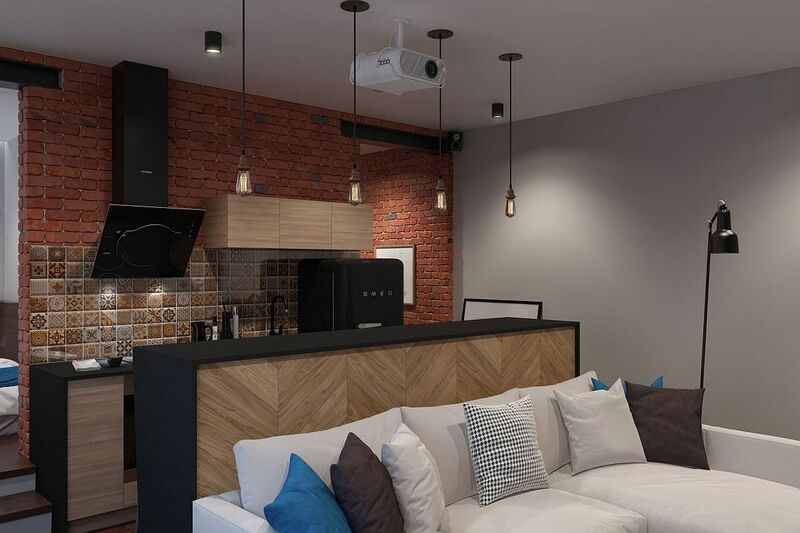 The new interior reflects this heritage with the fabulous use of exposed brick walls that add textural charm to the open living area. 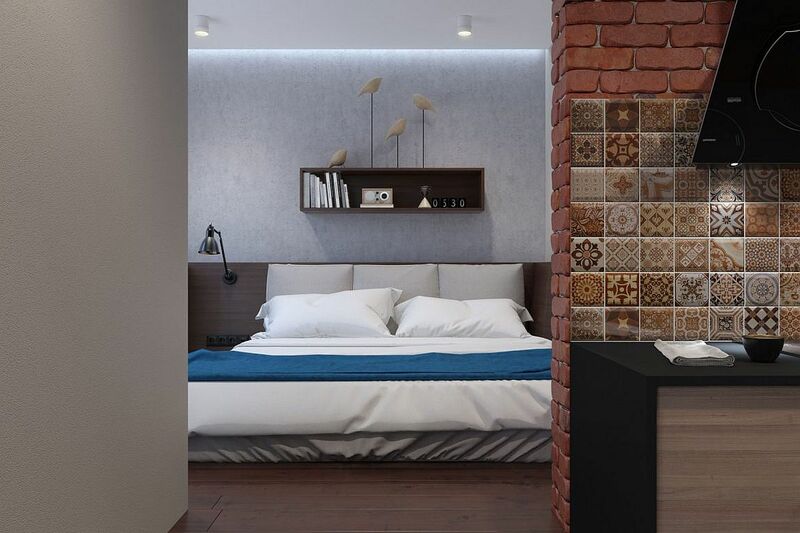 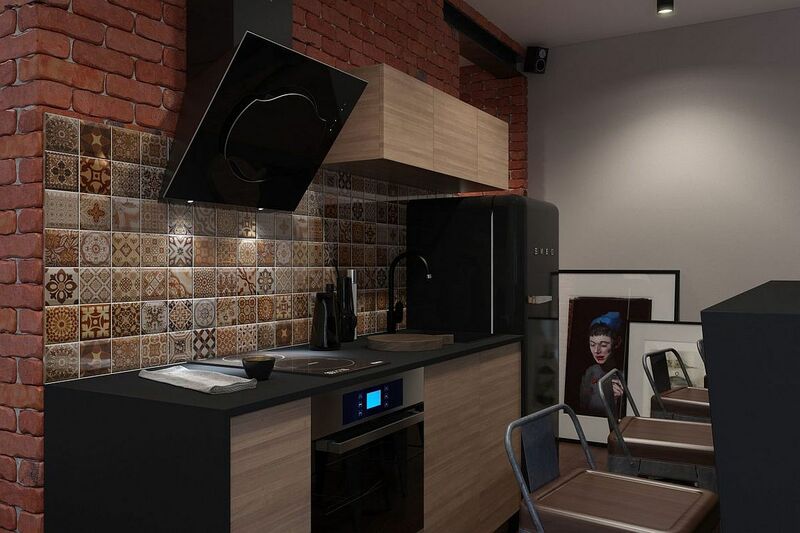 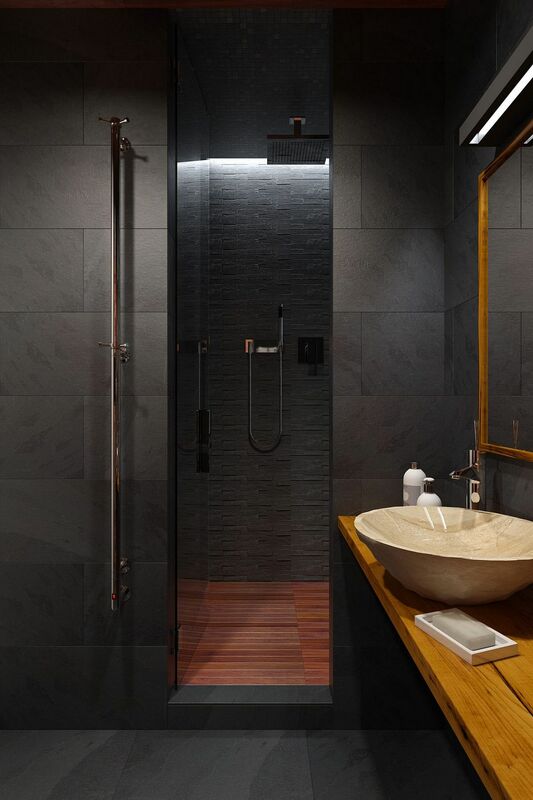 Natural stone and wood along with slate add to this unique blend of contrasting textures that fashion an urbane yet inviting apartment. 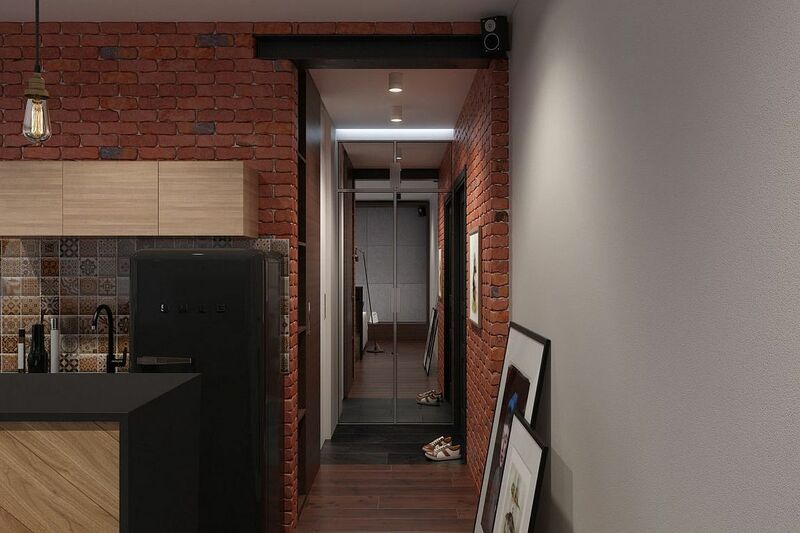 A plethora of space-saving features start right at the hallway, with mirrored doors adding visual space and sliding doors tucking away the laundry and the bathroom. 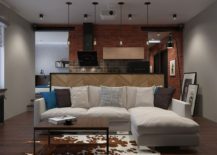 Step in further, and it is the living room that greets you with its cool sectional in white, the entertainment wall and minimal storage units. 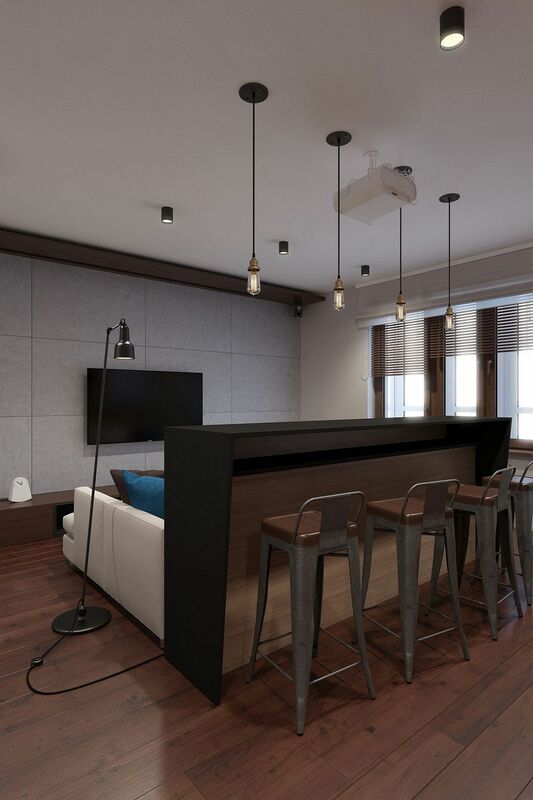 The dining table bar also doubles as the home bar area when needed and is also used to tuck away DJ equipment, while the adjacent kitchen keeps things simple and uncomplicated. Since cooking was not high on the priority list of the homeowner, it is just a refrigerator along with other basic appliances that one finds here. 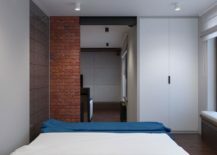 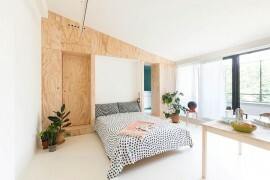 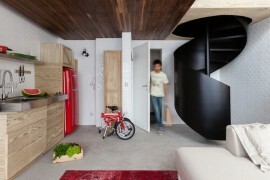 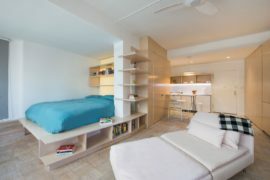 The bedroom is connected to the living area visually, and a platform bed ensures that things remain uncluttered and minimal in here as well. 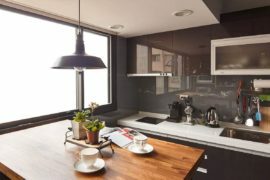 The color scheme inside the apartment is dark and intimate and seems to fit in perfectly with the popular perception of a ‘cool bachelor pad’. 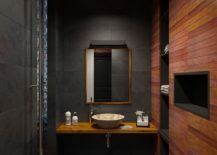 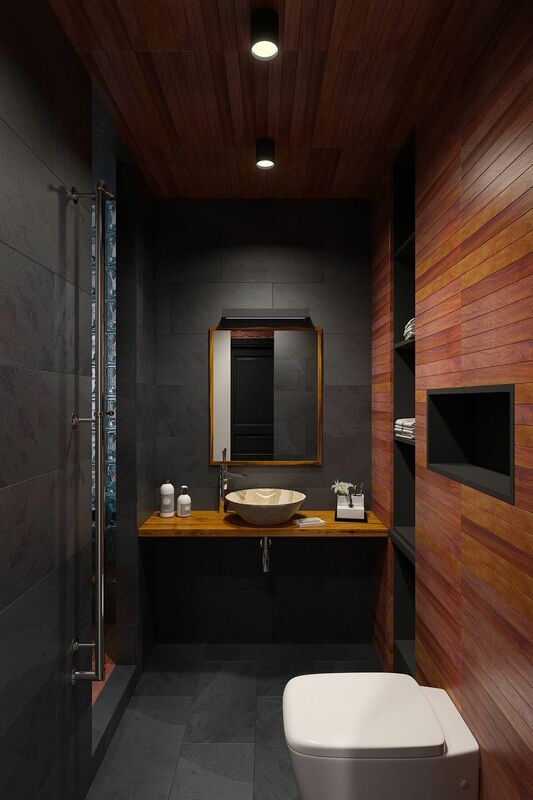 A stunning bathroom in slate and teak along with a small balcony that serves as a relaxing hangout complete this ingenious 44-square-meter modern apartment.